After spending a week at Walt Disney World, I have a better understanding of how the MagicBands work. And, there are a few lessons I learned about along the way, as well. Let me begin by stating that I was really looking forward to this experience, regardless of how it turned out. I feel it is my responsibility to be real in what I see with my own eyes. The lesson I learned at check-in was to verify which MagicBands have charging privileges, what the limits are, and what card you are backing those charges up with. I had set all of this up before arriving, but found out over the next few days that it didn’t get recorded in the system. So, save yourself some extra steps and double-check before you leave the front desk. It only takes a few moments to fix the problem. From the moment we walked into The Art Of Animation Resort, our MagicBands were put to use. We used one for checking in right at the start. This did seem to hasten the process considerably. The bands also worked well with our room door. I would suggest that everyone in your party take a turn just to verify all MagicBands are working. Also, the doors at the end of the corridors will open with the use of the MagicBands if you want to bypass the elevator. Entry to all of the parks was smooth with the use of the MagicBands. It is important to remember which finger you used when you first arrived, that can slow you down if you forget. I didn’t find my MagicBand to be in the way, but did have a couple of incidents with it popping off if I accidentally hit a rail or armrest the wrong way. Other than that, I have no real concerns. FastPass+ worked fairly well, also. One thing I did discover is that it is more difficult to change times or experiences once you arrive in your park for the day. We were there during what was supposed to be a less busy time, but the parks all seemed to be more crowded than expected. And, this made changes much less available. And, with the introduction of tiered attractions, it will be very helpful to make sure you have your choices before you arrive. For some, this may be an issue. For the uberplanners, not so much. The MagicBands do make charging easier, but I did not find it more tempting to tap and go with more souvenirs. I suggest that if you know what your limits are, you will have no problem remaining within those limits. But, if you have the tendency to spend freely, you may not want to have your band armed for charging. Just a thought! Overall, I like the MagicBands, but I think I prefer the old FastPass system a bit more. We were able to make use of a few of those during our stay. We weren’t trying to cheat the system, but it helped to put things in a better time frame for our visit. But, we have just learned that the Legacy FastPass system is slowly being phased out. There are a few resorts that are no longer issuing Key To The World cards, unless requested. 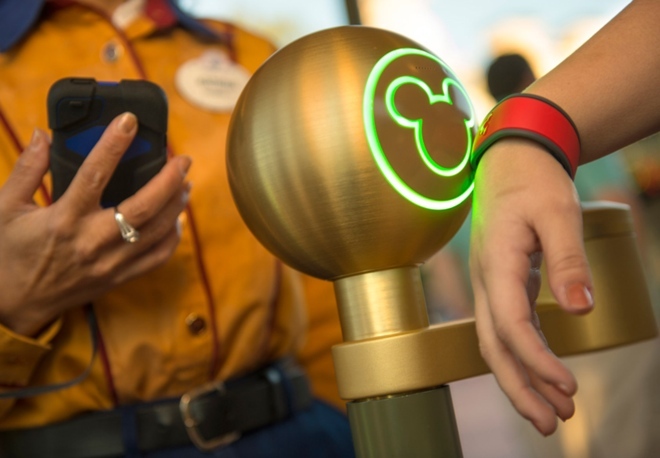 And, it was just announced that Disney’s Animal Kingdom will begin testing the new RFID technology by allowing anyone from any resort to make FastPass+ choices. Offsite visitors will be limited to making those choices once they arrive at the park. So, I would guess that the paper FastPass machines will be turned off during this testing. I hope you find this helpful information. And, if you have any questions, please feel free to leave me a message at the bottom of this post. I’ll be sure to respond promptly. Tomorrow, Restaurant Reviews…there may be a surprise on this one! !